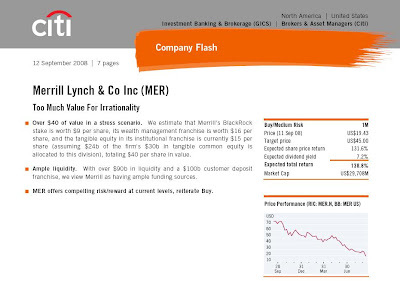 So it seems, with Merrill trading at $17.76 as I type (and this includes a "Citi Flash" bounce earlier today to $19.20), that this is one whopper of an opportunity. Citi itemise $40 of value and toss in another $5 for (in car mechanic speak) sundries. Or maybe they simply like numbers divisible by 9. I must be misreading it but I can't seem to find the timing on this expected 165% return. Maybe it's one of those feared 'long-term' investments (ie short-term gone awry). Or perhaps some liberty-taking by Citi with the efficient markets hypothesis. Sarcasm aside, they may be entirely correct but not - for understandable reasons - want to lay out the timing. And timing is of course the secret to Great Comedy. 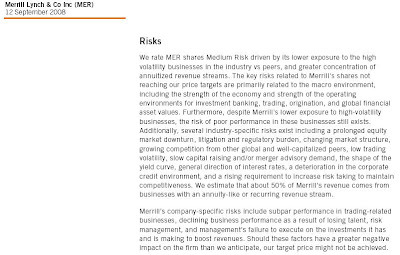 NB1: Thanks for the concern, short closed Friday prior to BoA's $29/share takeover of MER. I agree, this would take some large man conkers to see this trade short term.